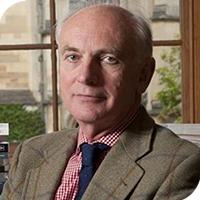 "The Great War and Today's World"
Hew Strachan read History at Corpus Christi College, Cambridge (MA, PhD) and is now a Life Fellow. From 1978 to 1979 he was Senior Lecturer in War Studies and International Affairs at the RMA Sandhurst. He serves on the Chief of the Defence Staff's Strategic Advisory Panel and on the Defence Academy Advisory Board, and is a specialist advisor to the Joint Parliamentary Committee on the National Security Strategy. He is a Commonwealth War Graves Commissioner.